Following its successful launch in 2015, Sligo Park(ing) Day returns again this year, taking place on Friday September 16, the afternoon of Culture Night 2016. Part of the global Park(ing) Day initiative, the Sligo event will again see on-street car parking spaces temporarily transformed into small urban ‘parks’ by local creatives and voluntary groups, for public enjoyment. 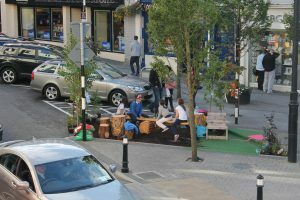 First held in Sligo last year, Park(ing) Day is a global event challenging how we view and use our streetscapes by temporarily transforming on-street parking spaces into mini public ‘Parks’. Originally a local event organised by artists in San Francisco in 2005, Park(ing) Day has become international with events taking place around the world annually on the third Friday in September. Eleven creatives and voluntary organisations participated in 2015 including IT Sligo’s Creative Design Students, the Rennafix Group, Clean Coasts, Sligo Cycle Campaign, Sheerin Landscapes, The Flat Earth Games Group, Maritza Loaiza, Sophie Skinner, Faoin Aer Landscape Architecture, and others. Even Sligo Library got into the swing of things with a reading table themed mini-park. The purpose behind Park(ing) Day is to raise awareness of the need for more open space in urban areas, to generate critical debate around how public space is created and utilised, and to improve the quality of our street in an inclusive and creative way. Participants are encouraged to be creative and inspired in shaping their respective spaces, and in engaging with the wider community in re-imagining local streetscapes, if for only a few hours. Often featuring plants, seating, and art, parks also provide opportunities for play, relaxation, entertainment, etc., and bring vibrancy, excitement and colour to normally hard urban landscapes. The Sligo event is co-ordinated in partnership with Sligo County Council and An Taisce North West Local Association, and has the support of local businesses, residents and community organisations. A Sligo Park(ing) Day trail map will be available to download from and print from www.facebook.com/Sligoparkingday and information available at each designated ‘Park’ and supporting businesses on the day.